Less than 24 hours before a marathon, there I was - walking and climbing all over the Matanuska Glacier. It was cold, slippery, and definitely one of the craziest things I've ever done. More than once I simply froze in place - not because it was that cold, but because I was unsure about my footing on the rugged ice. But with a little help - thanks Larry, and those French tourists - I made it to the glacier's summit. If this was one of Alaska's landmarks, I was all in. You would think I would have figured it out by now. 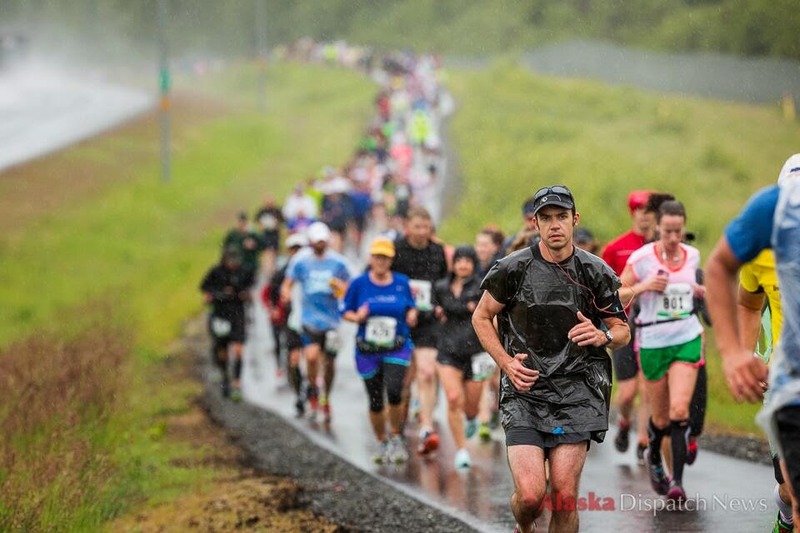 The Mayor's Midnight Sun Marathon in Anchorage, Alaska was going to be my 11th marathon. I had read the books and magazines, and followed my coach's marathon plan religiously. The week before a marathon is supposed to be an easy week. The experts recommend maybe a few slow miles around the block each day, and not much else. For my first 10 marathons I followed their advice. But for this marathon I was in Alaska. I had been waiting to visit our nation's 49th state since I was a little girl, when I first read stories about Alaskan families enjoying life while braving harsh weather and wild animals. I couldn't wait to sample all that Alaska could offer me in one week. Larry and I arrived in Alaska on a mission - to complete our 50 States, 50 Epic Rides project by bicycling in our 50th state. Our first full day in Anchorage, mission accomplished! We spent the day cycling on the Tony Knowles Coastal Trail, a trail outside of town that both hugs the Cook Inlet - along the same route that Captain James Cook himself sailed to Alaska back in 1778, - and meanders into the woods. Much of the ride was also the marathon course. It had been several years since anyone running the marathon had seen wildlife on the course. However, after only cycling for about 3 miles, a woman walking in the direction that were cycling said, "Be careful there is a baby up ahead." My first thought was: I love babies! But she did not mean a chubby cheeked human toddler but a moose baby. And where there is a moose baby there is also a moose mother, and the rule in the woods is: never come between a moose mama and her baby. We didn't. But Larry was able to get a very cool picture of the mother and child moose. And then a few miles later, we came upon a group of cyclists peering into the woods. One of the men raised his hand up in the "V" for Victory sign (or peace sign, depending upon which generation you come from) behind his helmet. Well, no matter what generation you come from, turns out this is the universal sign for - watch out, there is a large male moose with antlers up ahead. Larry was able to get a picture while I stood as still as I could, thinking I had never seen "stand a few feet away from a moose 4 days before a marathon" in my books, magazines, and marathon plan. Eager to see more wildlife, the next day we found ourselves climbing into a sea plane - taking off from a water parking lot and landing again in the water. We were then whisked away by boat to view bear catching their lunch - fresh salmon swimming upstream. Next up was to see a piece of history - Crow Creek Mine, the preserved gold mining camp from 1898. Larry and I both panned for gold. 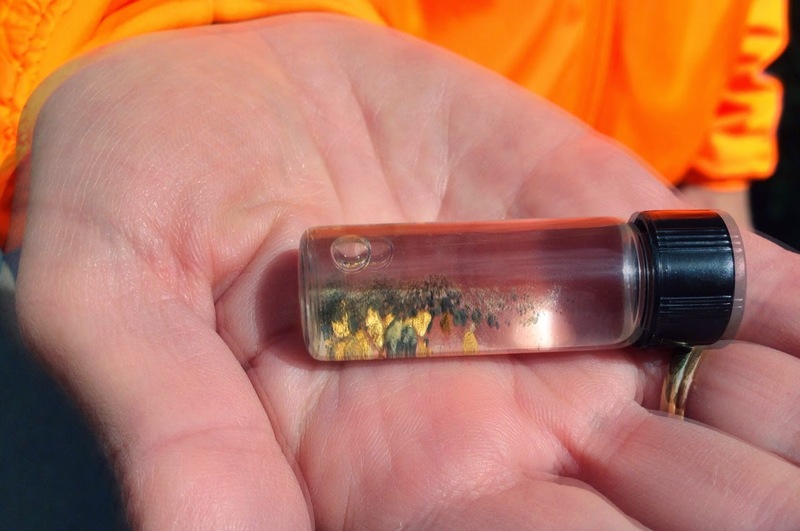 I found a few flakes but Larry caught gold fever and found a bunch of flakes! He said he found enough for us to retire; as long as we have teeny tiny dreams. I think we'll keep our day jobs. to upscale dining at our Hotel, The Hotel Captain Cook, with our good friends Jackie and Harry Whiting's son, Harrison. Harrison is now an Air Force pilot stationed in Anchorage. We spent several hours enjoying our catching up with him, swapping Air Force stories from the past and present. We stopped by the marathon's Expo the day before the race. I picked up my bib number and met the marathon's mascot. This time I wasn't nervous standing so close to a moose. Then began the pre-marathon rituals. There was the pasta dinner, the laying out of the entire outfit for the race, and the obsessive checking of the weather. Then there was the Alaska specific ritual - the covering of the windows with aluminum foil to block out the midnight sun. The marathon was scheduled for the summer solstice, so since there sould be sunlight almost all night long, Larry came up with the idea to block out the sun coming into our hotel room. It worked! Every time I clicked on Weather Underground, the forecast grew worse. "Stop checking!" Larry said, when he realized that each time I checked, the rain forecast went up 5% and (up to 90% the last time I checked) and the temperature went down (glad he made me stop checking when the forecast went down into the 40 degree mark). The Mayor's Marathon race director, Michael Friess, sent us a message through Facebook: "12 hours until the first gun. Let's have some fun Anchorage! And we never let a little rain spoil a party...Alaskans are much, much tougher than that!" Well, this Florida girl had never run a marathon in cold rain - but I could be as tough as any Alaskan. I come from a land where there had been 4 major hurricanes in a few weeks... sharks have nipped at our toes when we swim in the ocean... and I have survived standing in line for Early Bird Specials. Game on, I was ready! The marathon staff did everything right. Instead of having us wait outside in the cold rain for hours before the race, we gathered inside a warm, dry gym at a local high school, just steps away from the start. I met many of the other runners. Most were either Marathon Maniacs - runners who run many marathons a year, or 50 State Club Members - runners who have run or are running marathons in all 50states. (My goal!) 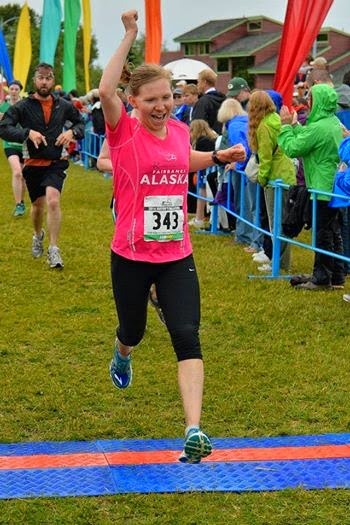 For whatever reason, all of us were eager to cross running a marathon in Alaska off our list. The race director called us all outside, we sang the Star Spangled Banner, the gun went off - and the race began. The cold and rain became irrelevant as I ran, because the scenery was spectacular. This was my first marathon where I ran by mountains shrouded in mist. It was also my first marathon that was about 1/3 a trail run - running in the woods over rocky paths. Our speed was slower while running in the woods, but I get it now why some people enjoy the challenge of trail running - you feel as if you are part of the woods, the environment. We also had to divert into the woods for a bit about a mile before the finish line, due to the Westchester Lagoon Bridge that had collapsed when too large a truck drove over it 4 days before the marathon. This was the bridge that connected the Coastal Trail to the Chester Creek Trail. Another bonus to running slower, due to weather and trail running, was people watching and hearing the others runners talking. Most of us hadn't anticipated inclement weather, so many runners were wearing whatever they had available to protect them from the rain. This was my first marathon where I saw lots of people wearing Hefty garbage bags while they ran. My favorite outfit was the woman who wore a hospital gown. I couldn't help but smile - she looked like an escapee from a mental institution as she ran along the trail, her hospital gown flopping in the wind behind her. And the conversations - it was like legal eavesdropping, listening to everyone talk. Most runners were commenting on the route, the weather, which mile marker we had just passed. But one conversation that will always stay with me was the man and woman talking about attitude. "My friend takes anti depressants," the man said to the woman. "I just like to run". The woman said, "Me too." I smiled at them as I ran by and said, "This is our anti depressant". "Yup," the man said. The marathon pack was small - there were 852 finishers. Small in numbers, but we represented all 50 states and 15 foreign countries. 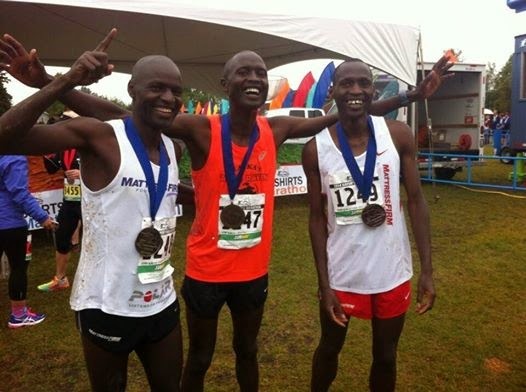 Three Kenyan brothers, two from University of Alaska at Anchorage and one from Tulane University, finished 1st (David Kiplagat) 2nd (Paul Rottich) and 3rd (Solomon Kandi). 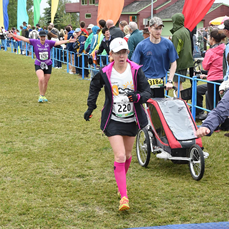 Another University of Alaska Seahawk, Davya Flaharthy, won the woman's race, by over 5 minutes. On of the cool things about the Mayor's Marathon was that it was several races. In total over 4400 people ran or walked, not only the marathon, but marathon relays, half marathon relays, and runs and walks of only a few miles. So, at the finish line, we marathoners were finishing with people who had run or walked a half marathon or only a few miles. It was fun to finish with parents pushing kids in strollers or holding their hands. After the race, I went back to the hotel room to relax for a bit before flying back to Florida that night. Alaska more than lived up to its reputation. It's bigger than life, beautiful, tough, and worth the long distance to get there. I can't wait to go back.